It’s the night of January 25, and in front of Syriza’s cramped election kiosk on Klathmonos Square in the center of Athens, an elated crowd is anxiously waiting for the first exit poll results. Soon enough the crowd breaks in delirious celebration: Greece has elected the first ever radical left-wing party in its history. It seems unlikely that anything could bring Greeks down tonight—but somehow everyone manages to also feel extremely distressed. According to the exit polls, Golden Dawn has come in third. The far-right organization has managed to preserve a solid core of voter support, even with about half of its MPs in facing charges for belonging to a criminal organization. On Monday morning, the official election results confirmed my fears. To be fair, compared to 2012—when the last general election was held in Greece—Golden Dawn is slightly less popular: Three years ago, 426,025 Greeks voted for Nikos Michaloliakos’s fascist organization, while about 388,000 voted for them this time. GD lost one of the 18 seats it previously held in the Greek Parliament. Why does the specter of neo-Nazism continue to hover over Greek democracy? And what dangers could Golden Dawn’s enduring presence in the Greek Parliament—faced both with a volatile political scene and an economic crisis—harbor for the country’s future? George Tsiakalos is a professor of education at the Aristotle University of Thessaloniki and one of few academics talking openly about Golden Dawn’s Nazi ideology and its damaging effects on Greek society. I ask him whether a potential blow to the fascist organization’s electoral percentage could be dependent on the success of the newly formed government or whether its failure could possibly lead to a solidification of the party’s support. “Let’s examine the negative scenario…” he says. “Basically, Greek citizens are the only ones with the capacity of offsetting a government’s ‘failures’ with their actions. I believe the real danger is elsewhere. During the economic crisis, a ‘binary line’ was drawn that limits the significance of ideological differences. It divides ‘austerity’ and ‘anti-austerity’ parties. That line didn’t exist in the past. Essentially, during the crisis, identifying yourself on a political or ideological level with a party or agreeing on basic things like education, human rights, immigration, state-church relations, etc., became less important than a party’s position on the issue of austerity. I ask him how Golden Dawn managed to keep its numbers up even though most of its key executives are in jail. “Personally, I didn’t think there would be a dramatic reduction in their numbers this time around. This, is not related with the organization’s members’ popularity and capabilities, but, it is, I think, a direct result of the other parties’ unwillingness to set as their clear and main goal the disappearance of Nazism from the political life of the country. If they even slightly adhered to this cause, it would be made clear in their everyday speeches on any matter. I don’t believe this is the case though. “The biggest mistake is that they deal with Golden Dawn as though they were a right-wing populist organization that merely happens to use Nazi symbols and deny the existence of the Holocaust. The truth is that Golden Dawn is very consciously Nazi: It is guided by an ideology that denies human equality—it believes equality is against nature. It evangelizes that there is a racial basis to civilization, that culture is a biological characteristic of the races, and that there is a hierarchy between the races and to that end, between cultures. “At the same time it ‘preaches’ that cultures are destroyed because of miscegenation—that is the belief that if you propagate with a person of a different race, the race will become dirtied or deteriorate. “These are the fundamentals of Golden Dawn’s political program and action. It is openly against immigrants and minorities because of the risk of miscegenation; it is against the disabled because it considers them a biological burden and a risk for the continued perseverance of the race; it is against democracy because democracy is based on the principle of human equality. “In 1946, the Nuremberg court ruled that ‘the Nazi party would be, from the moment of its formation, due its ideology and program, considered a criminal organization.’ In Greece, the percentage of the traditional nationalist and right-wing voters (which always hovered around 6 or 7 percent) has increased and due to the ideological workings of Golden Dawn, it has managed to create a space of its own that openly embraces the Nazi ideology. Thanasis Kampagiannis is a lawyer working with the initiative Prison for Golden Dawn and, having been part of the antifascist movement’s prosecution team during the trial of Golden Dawn, is familiar with the organization’s activity. I met him at his office in downtown Athens, where he was awaiting the final indictment of the the detained GD members. I ask Thanasis what he thought of the election result and the percentages of Golden Dawn. “I think that at this stage of the political crisis, Golden Dawn did not have any substantive wins,” he replies. “In fact, I believe that there was a positive outcome, in that it suffered losses in major urban centers. Of course, their threat is very real and GD will not be defeated if we simply put our heads in the sand. I ask him if the new government’s potential failed policies and decisions in the near future could end up strengthening the fascist organization. “Golden Dawn was created for exactly the political period we are living in—to act as a counterweight to the radicalization of Greek society, which is clearly expressed by the rise of Syriza,” he says. 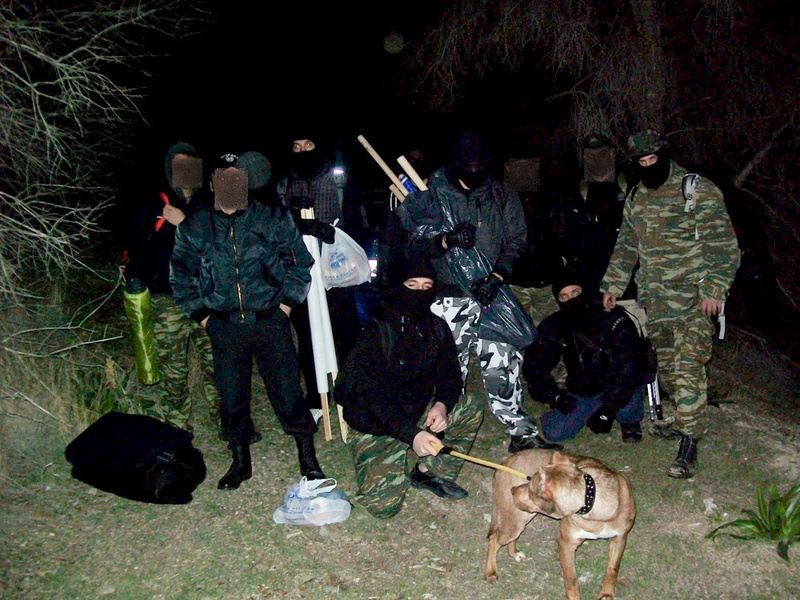 “If you listen carefully to the messages and rhetoric of Golden Dawn’s leader, Nikos Michaloliakos, you will see that he speaks clearly of an organization that has ‘soldiers’ on the streets to confront ‘the left threat.’ Golden Dawn places itself at the service of those distressed and agitated by radical decisions, and I am, especially referring here, to bank and marine interests.